"Take a picture, quickly!" Spouse urged. He was occupied driving the car. 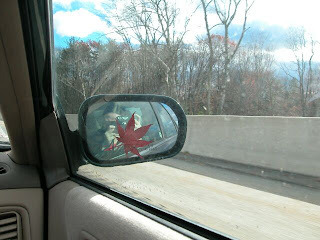 Rushed, I scrambled for my backpack, reached inside for the camera, untangled it, took off the lens cap, switched the camera on and aimed it at the car's side mirror, at the red, seven-pronged leaf plastered to the glass. I turned the camera this way and that, not certain that the angle or the lighting were perfect. I took a picture eventually and adjusted the camera in hopes of taking another. But when I lifted my eyes to the mirror, the leaf had vanished. Less than two seconds had passed by but the leaf had been tugged by the wind and the force of the car's speed, and off it went, spiralling out of our sight forever. Even as I took the lone photograph the leaf must have been on the verge of tearing away, and there I was worrying about capturing the image properly. I very nearly lost the opportunity altogether. The camera would not, on a typical day, have been in our possession; but we were on our way to meet two people for the first time: Beth, whose stories I read and relish, and her husband Charlie, and it was not, then, an ordinary excursion. Over the years I have had ample occasion to meet friends I had previously only encountered through their written words, or a friendly gift package or a telephone call. I have learned that it is one thing to exchange words from the obscurity of a computer, quite another to venture out and share oneself a little more. As we sped toward the restaurant my restlessness set in, and I thought of times I had waited at airports for a face not quite familiar to me, of how exhilarated and timid and nervous and thrilled I grew as the precise moment for meeting approached. Part of that tension arises from the hope of improving a friendship, that in revealing oneself beyond the pen, so to speak, one might find that on first meeting a person one already knows, the lines become ever more blurred and it happens that the self-doubt was for nothing. So it happened yesterday, when Spouse and I reached the restaurant. Any observant soul watching the four individuals laughing and telling stories and commenting on the food might think they had all known each other for years on end, and to judge by the rapport and comfort that stirred Spouse and I as we experienced the fine company of Beth and Charlie, it felt that way too. I suspect that the leaf, as it twirled and leaped and danced into the sky like a pointed flame, considered that its work was done: reminding me gently about taking opportunities, and being bold enough to trust in adventures, in the moment and in the little joys that might lie around the corner. What a great story! And it is so neat that you all got together. Just wonderful. what a lovely way to tell the tale! It was so much fun meeting you both yesterday, I'm still all aglow even after a morning in court pretending to be fierce. I look forward to meeting you both again, I think a true friendship sprung from our words. Very fun that you got to meet a fellow blogger - and that it cemented your friendship. I did that only once, and we didn't get along quite as well as in your story. But we are still friends! Nan, we had a great time. We had so much fun! Beth, "pretending to be fierce"- I love that line. I can just imagine it. We too are still talking about the couple of hours we had together. We all had such fun talking and getting to know one another. Paul, sometimes it doesn't work out at all, sometimes better than others, but it's always a pleasure to try and see what happens. One of life's adventures. A wonderful post. It lifted my spirits. It's always great to meet people of like-minded interests. Very well written. Glad you all hit it off. Steve, that's good to hear- and it is always good to find people that we have much in common with. It's too easy to become isolated and read all the wrong news and feel like there are no good people left in the world. Delightful blog! I found you through Beth's Stories and am soooo glad I did. I love your way with stories, your ability to connect little happenings with human emotions. I felt what you felt on your way to the Cracker Barrel to meet Beth and Charlie for the first time. Your writing is alive. Barb, I tell you, it made my day to find I have a new reader :) Thanks for coming by and leaving such a kind comment.